Domestic violence - Application can be filed only against adult made person - Application against ladies quashed. Order lower court though appealable, but High Court can interfere under Section 482 Cr.P.C. for immediate relief or correcting grave error. For the Petitioners :- Shri R.K. Sharma, Advocate. For the Respondent :- Shri Gaurav Samadiya, Advocate. Pepsi Foods Ltd. v. Special Judicial Magistrate, 1997(4) RCR(Criminal) 761 : (1998)5 SCC 749. B.M. Gupta, J. - The instant petition is for impugning the order dt. 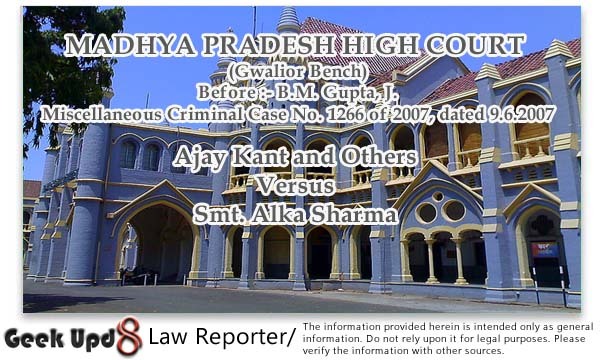 18th January, 2007 passed by Judicial Magistrate First Class, Gwalior in Criminal Case No. 848/07, whereby the learned Magistrate has issued notice to the petitioners on an application filed by the respondent under section 12 of the Protection of Women from Domestic Violence Act, 2005 (hereinafter referred to as "the Act"). 2. Brief facts of the case are that respondent Smt.Alka Sharma has filed one application under Section 12 of the Act against the petitioners. On which the learned Magistrate, vide order dated 18th January, 2007, has issued notices to the petitioners. It has been averred in the application that the respondent has married with petitioner No. 1 on 16th of May, 2005 at Gwalior. For a period of 4-6 months she became pregnant and thereafter the petitioners started harassing the respondent demanding Rs. 2 lacs and one Maruti car from her parents. As the father of the respondent is a pensioner, he could not fulfill the demand. He reported the matter to Mahila Police Station at Padav, Gwalior on 2nd November, 2005 but the report was not lodged and no action was taken. On 3rd February, 2006 the respondent delivered a male child in the hospital. Thereafter, on 17th February, 2006 the petitioners separated the child from the respondent, kept him alongwith them and deserted the respondent. Consequently, since 20st February, 2006 she is living in her matrimonial home without her son. Petitioners are trying to declare the respondent as mentally sick and to remarry the petitioner No. 1. Admittedly, one application for divorce has been filed by the petitioner No. 1 against the respondent and the respondent has filed an application under Section 125 of Cr.P.C. claiming maintenance from him and also she has filed another application under Section 9 of the Hindu Marriage Act for seeking a decree of restitution of conjugal rights against the petitioner No. 1. These applications are pending in the Family Court, Gwalior. On these grounds, the respondent has prayed in the application for taking legal action against the petitioners and also to punish them. (A) That, the respondent was mentally sick before the marriage which was not disclosed by the respondent. On this ground, application for divorce has been filed by petitioner No. 1 on 15.5.06 in which proceedings for reconciliation have been failed on 21.9.06. Only for creating pressure against the petitioner No. 1, the present application has been filed on false grounds by the respondent on 23.11.06. "Domestic violence is undoubtedly a human rights issue and serious deterrent to development. The Vienna Accord of 1994 and the Beijing Declaration and the Platform for Action (1995) have acknowledged this. The United Nations Committee on Convention on Elimination of All Forms of Discrimination Against Women (CEDAW) in its General Recommendation No.XII (1989) has recommended that State parties should act to protect women against violence of any kind especially that occurring within the family. 2.The phenomenon of domestic violence is widely prevalent but has remained largely invisible in the public domain. Presently, where a woman is subjected to cruelty by her husband or his relatives, it is an offence under section 498A of the Indian Penal Code. The civil law does not however address this phenomenon in its entirety. (3) While framing charges under sub-section (1), the Magistrate may also frame charges under section 498-A of the Indian Penal Code or any other provision of that Code or the Dowry Prohibition Act, 1961, as the case may be, if the facts disclose the commission of an offence under those provisions. The offence under Section 31 of the Act will be cognizable and non-bailable as provided under Section 32 of the Act. 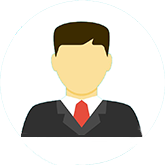 Section 8 of the Act provides for appointment of the Protection Officer and Section 33 of the Act provides for penalty for not discharging duty by the Protection Officer. Despite, as mentioned in the objects and reasons that for providing a civil remedy, this act has been enacted, the provisions of Sections 19, 27, 28, 31 to 33 clearly mention that some of the proceedings under the Act are of criminal nature. Under Section 19 to 22 of the Act an order to provide residential facilities, monetary reliefs, custody order for a child and compensation can be ordered by the Magistrate under the Act. Except a part of Section 19 with regard to direction of execution of a bond and dealing the same as provided under Chapter VIII of the Cr.P.C., all the reliefs under Sections 18 to 22 appear to be of civil nature. Thus, some of the proceedings under this Act can be said to be of civil nature and some of the proceedings can be said to be of criminal nature. Section 12 of the Act provides that an application(not a complaint) for seeking one or more reliefs under the Act can be filed. On perusal of Sections 18 to 22 of the act, it appears that the reliefs under these sections as mentioned hereinabove can be passed on the application under Section 12 of the Act. 2(d) "complaint" means any allegation made orally or in writing to a Magistrate, with a view to his taking action under this Code, that some person, whether known or unknown, has committed an offence, but does not include a police report. It is clear by this definition that a complaint as provided in Cr.P.C. can only be for an offence. As mentioned hereinabove only two offences have been mentioned in this Act and those are (1) under Section 31 and (2) under Section 33. It appears that this word complaint appeared in the definition of respondent has been used for initiating proceedings for these two offences and an aggrieved wife or female living in a relationship in the nature of a marriage has been given a right to file a complaint against a relative of the husband or the male partner. This word complaint cannot be considered beyond the scope of the main provision of this Section which has been defined in first part of Section 2(q) that is for any relief under this Act. As provided in Section 31 of the Act, a complaint can be filed against a person who has not complied with a protection order or interim protection order. Thus, it is clear by the definition of respondent that for obtaining any relief under this Act an application can be filed or a proceeding can be initiated against only adult male person and on such application or under such proceeding, aforementioned protection order can be passed. Obviously those orders will also be passed only against the adult male person. As provided under Section 31 of the Act, non-compliance of a protection order or an interim protection order has been made punishable and as such it can be said that the complaint for this offence can only be filed against such adult male person/respondent who has not complied with the protection order. Hence, it is clear that the application under Section 12 of the Act which has been filed by the respondent against petitioners No. 3 and 4, who are not adult male persons, is not maintainable. (D) The proceeding has also been assailed on the ground that before issuance of the notice, learned Magistrate has recorded the statement of the respondent which is not required. It is true that recording of statements as provided under Sections 200 and 202 of Cr.P.C. is not required before issuance of the notice because application under Section 12 of the Act is an application and not a complaint. However, this action of the learned Magistrate cannot be a ground for quashing the proceedings because as provided by sub-section 2 of Section 28 of the Act, the Court/learned Magistrate is not prevented from laying down its own procedure for disposal of an application under Section 12 of the Act. (F) The last ground raised by the petitioners is that in the application the relief of penalizing the petitioners has been prayed for, which is beyond the provisions of the Act. On perusal of the last paragraph of the application, it is prayed that after registration of the case, petitioners be legally penalized. It is true that at this stage in the application it was not required for the respondent to claim such relief, however, if it has been claimed, this cannot be a ground on which the proceedings can be quashed. At the most, such reliefs if unnecessary, can be negated. 4. Although it is not argued yet it appears appropriate to mention that any order passed by the learned Magistrate under the Act is appealable as provided by Section 29 of the Act. Usually when an opportunity to assail the impugned order in revision or appeal is available, taking recourse under Section 482 of Cr.P.C. is not required. However, it is observed by the Apex Court in para 26 in the case of Pepsi Foods Ltd. and another v. Special Judicial Magistrate and others, 1997(4) RCR(Criminal) 761 : (1998)5 Supreme Court Cases 749 that some time for immediate relief Section 482 of the Code or Article 227 may have to be resorted to, for correcting some grave errors that might be committed by the subordinate courts. Considering the steps taken by the learned Magistrate against the petitioners No. 3 and 4, this petition has been considered herein. 5. In view of all, as discussed hereinabove, the petition deserves to be partly allowed. Consequently, it is partly allowed. The proceeding against petitioners No. 3 and 4 is quashed. It is directed that the learned Magistrate will deal the application as provided under the various provisions of the Act and as observed hereinabove.